Daily pillbox “pops” out for easy carrying! The One-Day-At-A-Time(tm) Weekly Medication Organizer Tray contains seven individual 1-Day Pill Reminders and a unique “snap-in” storage tray. It allows you to fill a week’s medication at one time and offers the convenience of taking one day’s medication with you. The individual 1-Day Pill Reminders have four compartments to cover all times of the day. 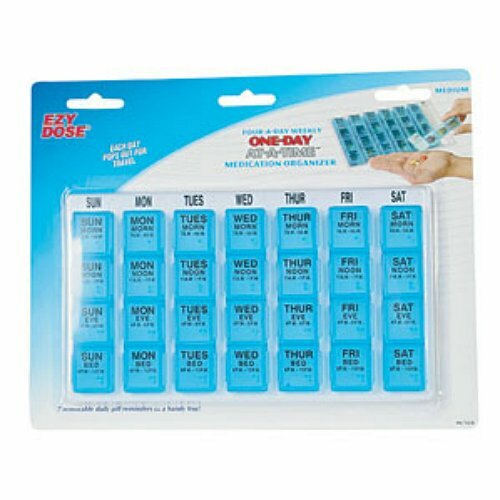 Each pill reminder is printed with the day of the week and the time of the day on each compartment. This convenient feature allows you to set up a full week’s medication at one time.